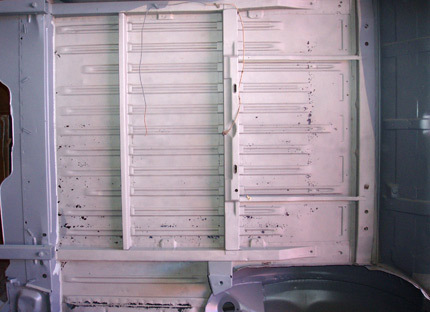 Rust Repair | American Stripping Co. Inc.
After micro mineral blasting and before metal spraying. After metal has been sprayed to fill rust holes. Ever tried welding a rust hole, only to find that the hole got larger, and the problem bigger? 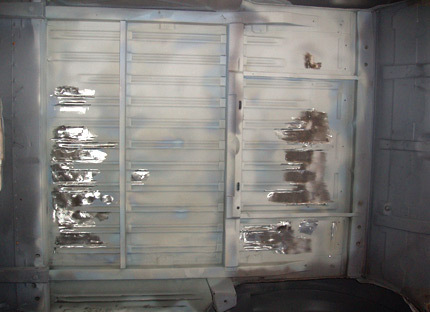 Advancing metal spray technology has allowed American Stripping Company to take metal repair to a new level. We can now reconstruct areas of rust damage using zinc (galvanizing). Pure zinc is first fluidized, then further atomized into a mist with air pressure, and is sprayed onto what’s left of the parent metal. Adhering mechanically to the high/low profile of the previously blast cleaned surface, the zinc then fills the area by building on to itself or a mesh backing. Once metal finished the area has a metal to metal repair that won’t rust. All this without having to cut out and replace the entire area, and without the price tag that comes along with that. By spraying pure metal onto the surface, filling in rust holes while also galvanizing the area, the problem is solved. The metal bonds mechanically at approximately 40,000 lbs. PSI, and can be applied as fine as .001 thousands of an inch to one foot thick. Rust holes of any size can be fixed, yet the process is slow enough that the surface temparature only reaches around 100° F. which avoids warping. The future of rust repair is here, and American Stripping Company is delivering it at an affordable price.